In order for a system to be truly accessible, it must be accessible at all links in the transport chain. Photo by EMBARQ. In some countries, as much as two thirds of the disabled population is also elderly. Designing transport for elderly or disabled individuals is crucial – and a human right – but can also be challenging. As developing countries make choices about accessible transport and build infrastructure, the needs of disabled and elderly citizens must be considered. Accessibility for disabled and elderly people is not only about physical access to vehicles and systems. In order for a system to be accessible, it must provide information in forms that are useable by everyone, and training for transport staff to understand the needs of disabled and elderly people. Streets, parks, and other urban areas must be designed in a way that enables people to move about safely and confidently. Accessibility also must be accounted for at every stage of a pedestrian’s journey. A wheel-chair accessible bus does no good if a disabled person can’t make it to the bus stop. The transport chain must be accessible at all points, for an individual can only make the journey if every link in the chain, from their door to their destination, is reliable, accessible, and affordable. In the past ten years, there have been several global efforts to promote accessibility through development aid. The United States Agency for International Development (USAID) package to Vietnam for 2004-2008 included specific requirements and standards for accessibility. Similarly, the UN Convention on the Rights of Persons with Disabilities, which was adopted in December of 2006 and entered into force in 2008, claims “the right to movement” as a human right, and explicitly details the rights of the disabled population to accessibility and mobility. But it is not clear how much either of these efforts have significantly resulted in increased accessibility. The need for concrete solutions and decisive action will only grow in importance given the aging populations of many countries, both developed and developing. Anticipating this need, some cities are already working towards improving accessibility for all. Curitiba, Brazil’s seventh largest city with a population of 1.2 million, provides a perfect example. There, accessibility is being addressed at all points in the transport chain, from bus entrances to station access, to feeder systems. 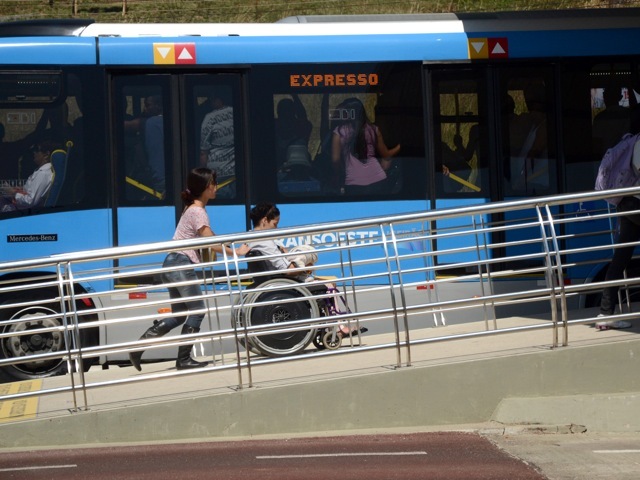 Now, 81% of all bus stops in Curitiba have raised platforms with ramps or lifts for wheelchair users, and the city has a goal of reaching 100% by 2014. Passengers board at floor level via bridge plates that lower automatically as buses reach the stop, which not only helps those in wheelchairs, but those who might have difficulty stepping up to a higher bus floor. Curitiba also has a high percentage of accessible feeder services (the parts of the transport chain that link individual’s homes with the backbone of Curitiba’s public transit, bus rapid transit). As a result of these efforts, disabled people make some 21,000 trips daily using Curitiba’s public transport, 1,000 of which are made by wheelchair users. This Friday, at the UN headquarters in New York, 140 members States and hundreds of non-governmental organizations will meet to discuss a way forward for inclusion of disability in the development agenda under the Post 2015 Development Framework and Disability dialogue. EMBARQ Director Holger Dalkmann will moderate a panel on key disability issues, including the importance of accessibility to public transport in order to achieve these developmental goals. Is crowdsourcing the next revolution in urban accessibility?